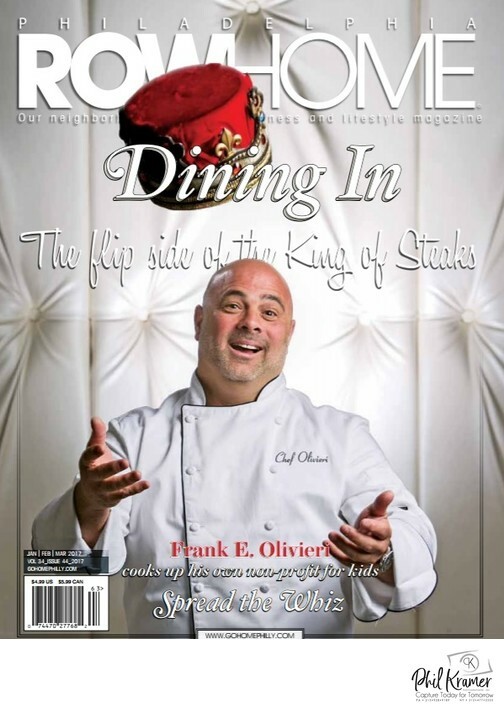 First of all, Frank Olivieri, from Pat's King of Steaks in South Philly, cooks one of the best cheesesteaks you'll eat in the city, and photographing him for Row Home Magazine was an exciting experience. I always enjoy working with icons in the Philadelphia community, whether it be for sports, charity, or cheesesteaks. Magazine cover shots attract potential readers to the content inside, so it is critical for a cover image to express the subject's genuine personality, and it must distinguish itself from other magazines without overwhelming the eye. A simple toss of the crown is enough to do that. Thinking about the cover shot, I pulled many images aside from this photoshoot, but determined that tossing the crown was fun, lighthearted, and appropriate for the personal content inside of this issue of Row Home Magazine. On some of the images that I pulled, Frank's crown was straight in the air, but in this image, it is slightly tilted, which makes the throw look more realistic and natural. The text wraps around the crown to create a three dimensional illusion on the magazine cover. The image looks as if it is leaping above the foreground and flying towards the reader! I'm in love with this picture because it shows that Pat's King of Steaks is claiming the throne and enjoying himself at the same time. Location: 227 Quarry Street, Philadelphia, PA 19106.